Are you a big Disney fan? 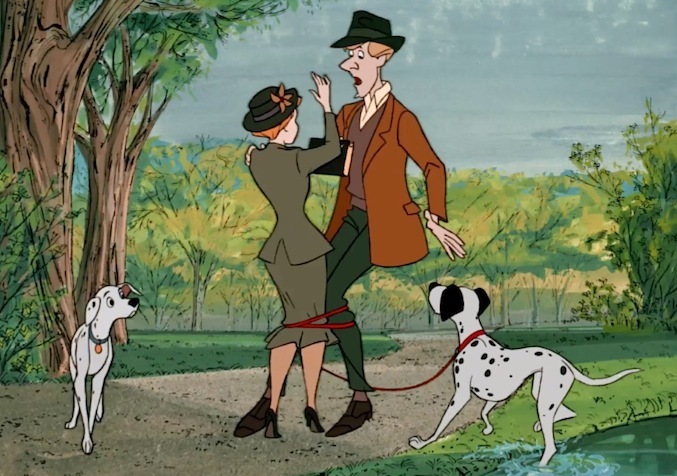 Love 101 Dalmatians? 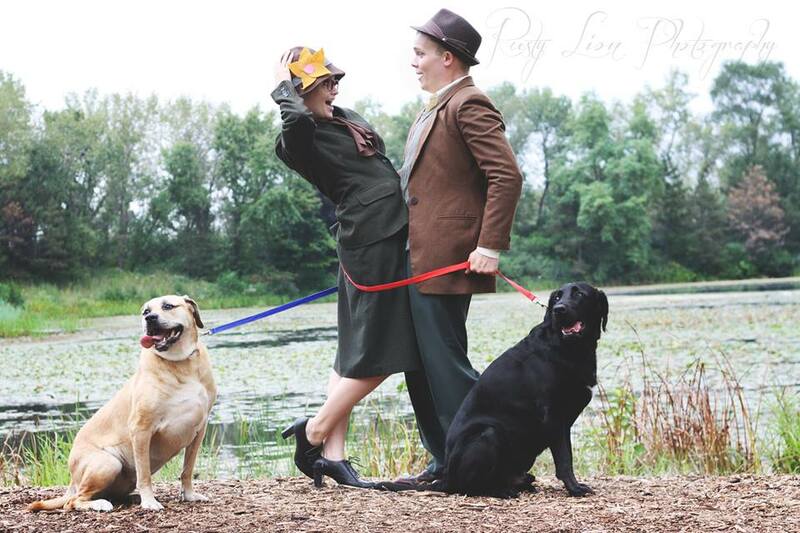 Corinne Jones and her fiance Tony Collier love both and wanted to recreate the scene from the animated movie in which Pongo takes the initiative to unite Roger and Anita in the park. 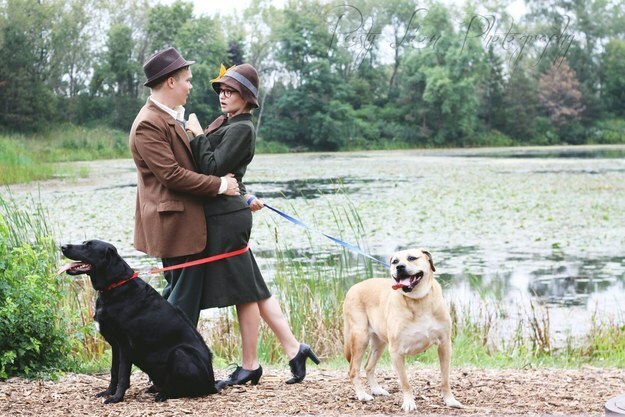 The couple dressed in period fashion and used their own dogs Izzy, a mastiff mix, and Mookie, a black lab mix. While not dalmatians the two dogs are such a part of their owner’s lives that they deserved a part in the photos and memories for the couple. 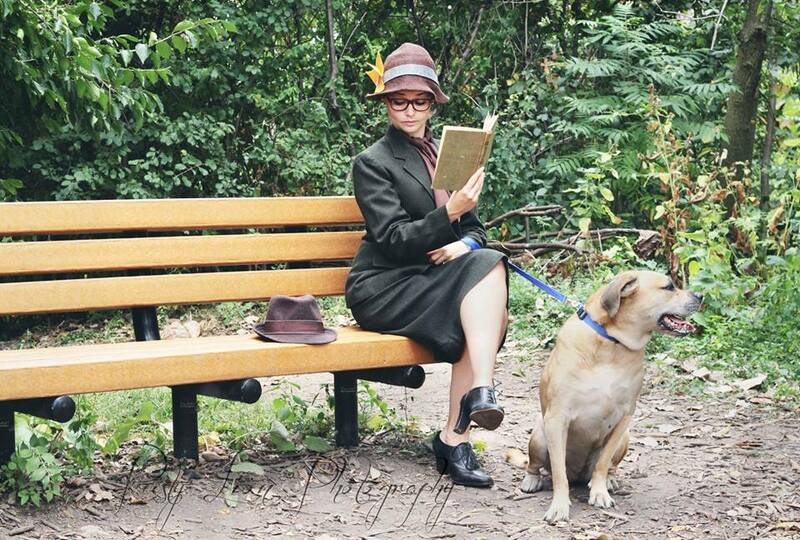 The dogs were incredibly well behaved and helped the shoot become what it needed to be. The hardest part was making sure that the couple’s facial expressions matched those from the animation scenes. The photographer is the couple’s cousin Melissa Biggerstaff. The couple started their relationship at a marching band formal in 2009. Disney has been a part of their relationship ever since. Their first vacation together was to Disney World and both worked at the Magic Kingdom after graduation. When Tony proposed he set up a scavenger hunt that ended with a picture of Corinne as Cruella da Vil, her favorite villain, and he used the lines of the villain’s henchman Horace who stated that he didn’t want a princess but a villain. So it was only natural to incorporate 101 Dalmatians into their engagement photos. In which they got wet but did not actually take a dip in the pond. Very cute and a unique idea! 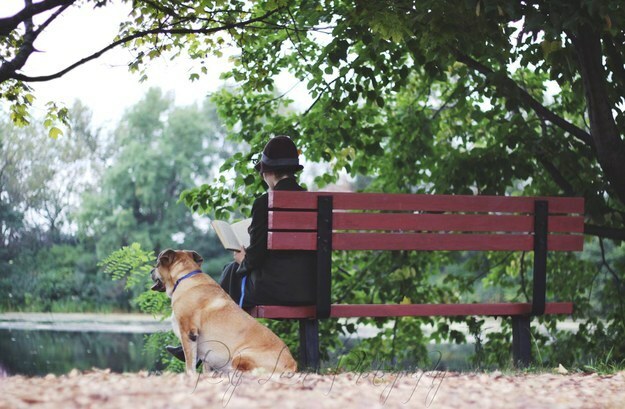 Did you incorporate your pets into special photo sessions like your engagement or wedding? 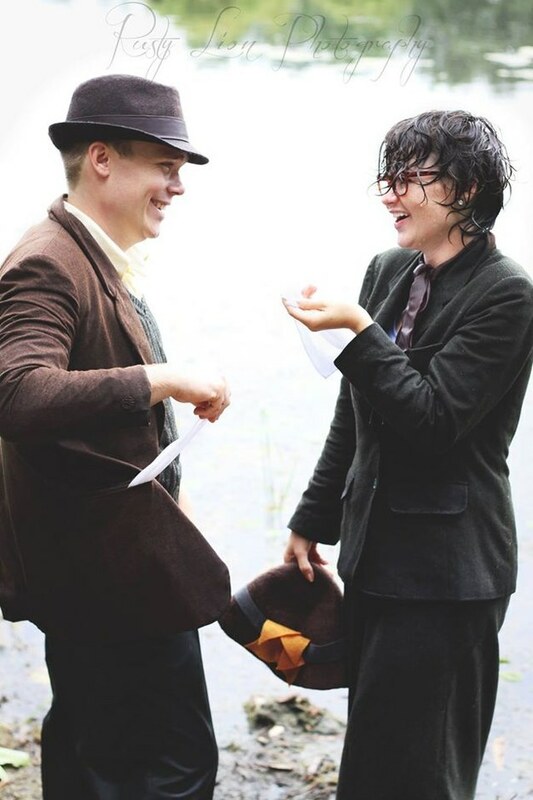 You can see more of the photos from the shoot here, and read more about the couple here. 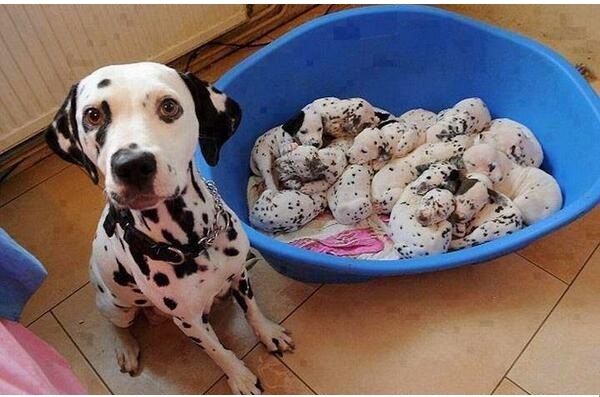 Okay, so it is not exactly 101 Dalmatians but a dalmatian named Pebbles had a litter of 15 puppies back in 2011. That is the same number of puppies as Perdi had in the Disney movie 101 Dalmatians. 15 puppies is quite a litter size! Just look at them all! You can read more about Pebbles and her litter on BBC News. So many cute little dalmatian pups! I cannot imagine having so many puppies around at one time. If the markers were nontoxic, this is funny and kind of adorable. 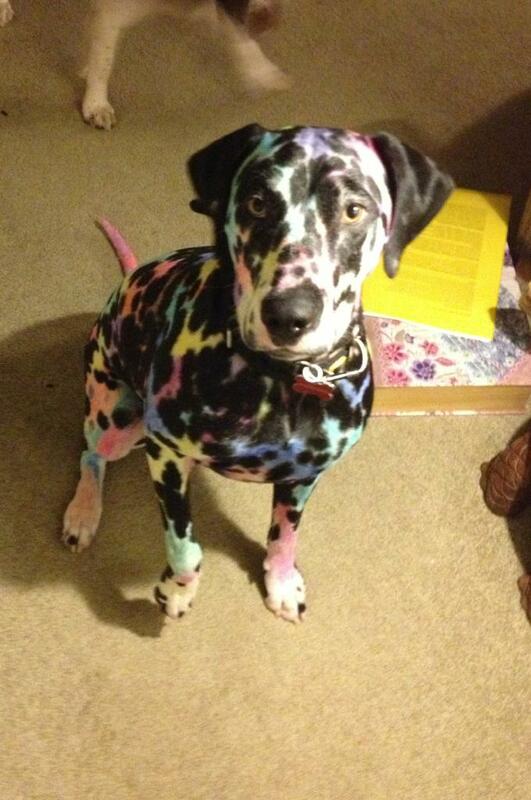 It makes me wish some dalmatians came with rainbow fur. That being said, you should always monitor things like pens and markers around your dog. From a toxicity standpoint, most things (even sharpies) are nontoxic. 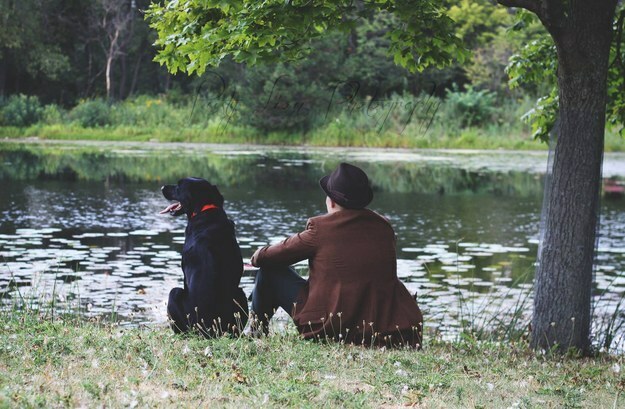 Your dog might end up a bit sick, and if you are worried contacting a vet is best. Consuming too much can make them very sick. However, the most danger is when your dog chews up something like a pen or marker and then eats the plastic which can cause an obstruction. 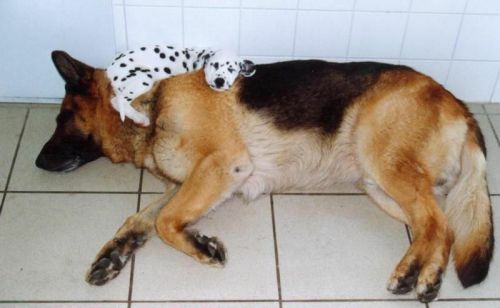 Here is a cute, little Dalmatian puppy sleeping on a German Shepherd. These are my two favorite dog breeds. I have only had a Dalmatian though.